Stainless Steel Insets Nest Together For Compact Storage When Not In Use. Made using corrosion resistant 300 series stainless steel with a satin finish. Sharp radius between sleeves rest securely in opening without tipping. 6" depth under the shoulder. SlottedSolid Flat Covers help reduce heat loss. Sold in case quantities of 6. NSF® certified. Food Pans Are Used For Use In Restaurants, Cafés, Cafeterias, Banquet Facilities And Other Foodservice Steam Table Or Food Handling Applications. Food Pans are made of cold and heat resistant polycarbonate material for long lasting durability and dependability. Translucent color pans withstand heat ranges of -40°F to 210°F and are used for various steam table or food handling applications. Rounded corners for easy handling and cleaning. Rolled top design for easy lifting and secure closing. Available in various sizes and 2-1/2, 4, 6 and 8 inch depths. Various size Solid and Slotted Covers and Drain Shelves also available. Anti-Jamming Steam Table Pans Are Used For Use In Restaurants, Cafés, Cafeterias, Banquet Facilities And Other Foodservice Handling Applications. Anti-Jamming Steam Table Pans are made of solid stainless steel construction for long lasting durability and dependability. 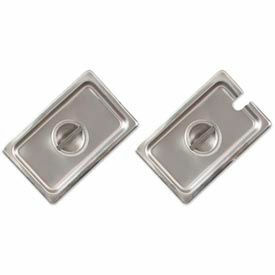 Feature rounded corners for easy food handling and cleaning. Anti-jam design for secure fit and easy lifting. Available in 1/18, 1/3, 1/4, 1/6, 1/9, Half and Full sizes with 2, 2-1/2, 4 and 6 inch depths and various package quantities. Steam Table Pans Are Used For Use In Restaurants, Cafés, Cafeterias, Banquet Facilities And Other Foodservice Handling Applications. Steam Table Pans are made of solid stainless steel construction for long lasting durability and dependability. 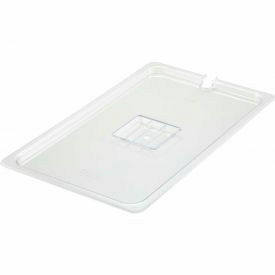 Feature rounded corners for easy food handling and cleaning. Squared top design for secure fit and easy lifting. 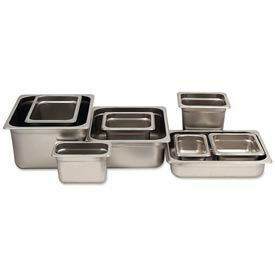 Available in wide selection of 1/3, 2/3, 1/4, 1/2 and Full size pans of various shapes, depths and package quantities. Perforated, Divided and Handled models and various size Solid and Slotted Covers and False Bottoms and Wire Holder also available. Alegacy® Rest-Rite™ Steam Table Pans Are Used For Buffets, Cafeterias, Dining Halls And More. Alegacy® Rest-Rite™ Steam Table Pans are made using 22, 23, 24 or 25 gauge stainless steel for lasting durability and strength. Full perimeter anti-jam ridge prevents pans from sticking together when stacked during shipment or storage. Pans are available in a wide variety of sizes. Capacities range from 5/8 to 22 quarts. NSF® certified. Alegacy® Anti-Jam Perforated Steam Pans Are Used For Easy Drainage Of Liquids In Steam Tables. 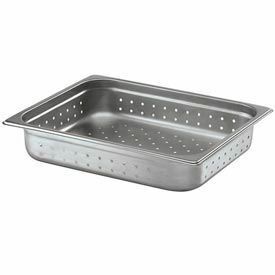 Perforated steam pans are made using stainless steel for lasting durability and strength. Edges fit tightly into wells and are reinforced to resist denting. 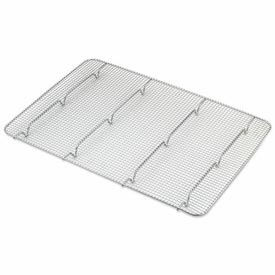 Perforated pans are available in Full Tray or Half Tray sizes in various depths. NSF® certified. Alegacy® Perforated Steam Pans Are Used For Easy Drainage Of Liquids In Steam Tables. Perforated steam pans are made using stainless steel for lasting durability and strength. 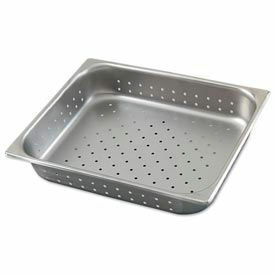 Perforated pans are available in Full Tray or Half Tray sizes in various depths. NSF® certified. 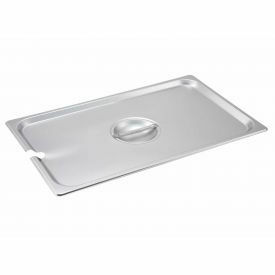 Alegacy® Steam Table Pans Are Used For Cafeterias, Buffets, Food Courts, Catering Events And Other Foodservice Industries. Alegacy® Steam Table Pans are made with stainless steel for long lasting durability and strength. Reinforced edges provide tight-fitting slots to ensure that steam stays enclosed. May be moved from freezer to oven without re-panning. Available types are 1/9, 1/6, 1/4, 1/3, 2/3, Inset, Half and Full Sizes. Available capacities range from 0.625 - 22 quarts. Alegacy® Steam Table Accessories Provide Food Service Functionality In Cafeterias, Restaurants, Buffets and Banquet Halls. Alegacy® Steam Table Accessories are made of stainless steel for long lasting durability and dependability. Variety of accessory styles, sizes and brands available to efficiently warm and serve food in steam table pans. Types are Drainer Pate, False Bottoms, Adapter Bars, Footed Pan Grates, Steam Table Pans, Roll Top Covers, Spillage Pans and Steam Table Roll Cover w/Plastic Handle. Dimensions and quantities vary per type and brand. Color finish is Stainless Steel. Steam Table Pan Covers Are Used For In Cafeterias, Restaurants, Buffets and Banquet Halls and More. 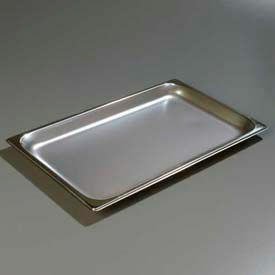 Steam Table Pan Covers are made of stainless steel for long lasting durability and dependability. Variety of styles, sizes and brands available to efficiently cover steam table pans. Flat covers include handles for easy lifting. Notched cover design allows for easy storage of serving utensils. Dimensions and quantities vary per type and brand. Sizes are 1/9, 1/6, 1/4, 1/3, 2/3, Full Size, Half Size and Is-25, Is-40/Is-70/Is-110. 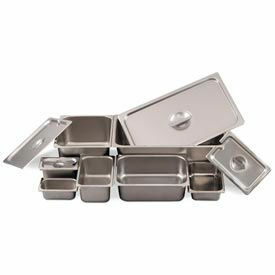 Stainless Steel Food Pans Are Used For Restaurants, Cafeterias And Other Food Preparation And Storage Applications. 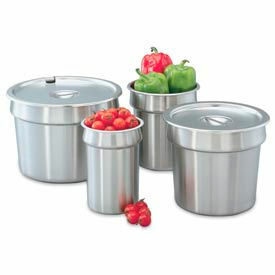 Stainless Steel Food Pans are made for long lasting durability and dependability. 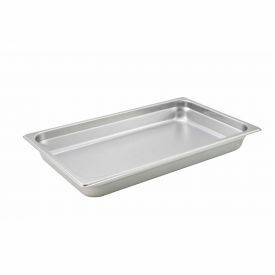 Wide selection of Baking Pans, Hotel Pans and light or heavy gauge DuraPan™ types are designed to fit into universal racks, heating elements and walk-in coolers. Full shoulder around edge prevents jamming during storage and facilitates stacking or nesting with other pans. Available in wide selection of standard sizes and .9 to 24.9 quart capacities. Clear or Stainless Steel notched or solid lids and chrome-plated Drain Grates also available separately.